Commemorates the death of Jesus Christ, the founder of Christianity, over 2000 years ago in both Eastern Orthodox and Western Christian traditions. Good Friday occurs on the Friday before Easter. The most popular and dramatic celebration of this event here is the annual parade in Little Italy. 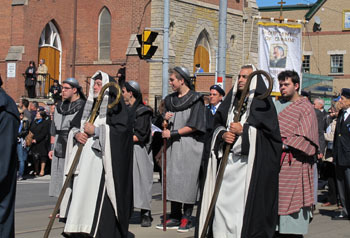 The Church of St. Francis of Assisi, 101 Grace Street (two blocks south of College and west of Bathurst), has been putting on a popular parade depicting the suffering of Jesus. Parishioners also dress up as Roman soldiers. The parade includes veterans of the Italian army and church leaders. The procession this year starts at 3pm and goes south from the church on Grace Street to Dundas, west on Dundas, north on Montrose, east on College, south on Manning, and west on Mansfield Avenue ending back at the church. Good Friday Procession. Little Italy. Copyright ©2014 Ruth Lor Malloy.